in the northern hemisphere at least, glaciers were at their maximum Holocene position relatively recently during the ‘Little Ice Age’ approx. 200-300 years ago, thereby removing any geomorphological record of previous glacier positions upvalley. For these reasons alternative, indirect proxies of past glacier activity have often been sought. In a recent issue of Quaternary Science Reviews, Canadian-based authors Maurer et al. present a record of Holocene glacier fluctuation in British Columbia, Canada, using a sedimentary record from small mountain lake. The reason this study caught my attention was the rather advantageous geomorphological setting, which allows the story of past glaciation to be told. The lake is located in a catchment which is currently unglaciated, but during times of more extensive glaciation the tongue of the nearby valley glacier extended into the lake catchment, providing inflow via glacial meltwater. When a glacier is present in the lake catchment the lake receives much coarser grained sediment than normal. Recognising this, Maurer et al. describe the past fluctuation of this glacier through the interpretation of a series of 3 lake sediment cores. They informally term the lake ‘On-Off lake’, presumably to reflect the numerous switches between glacial and non-glacial inputs. 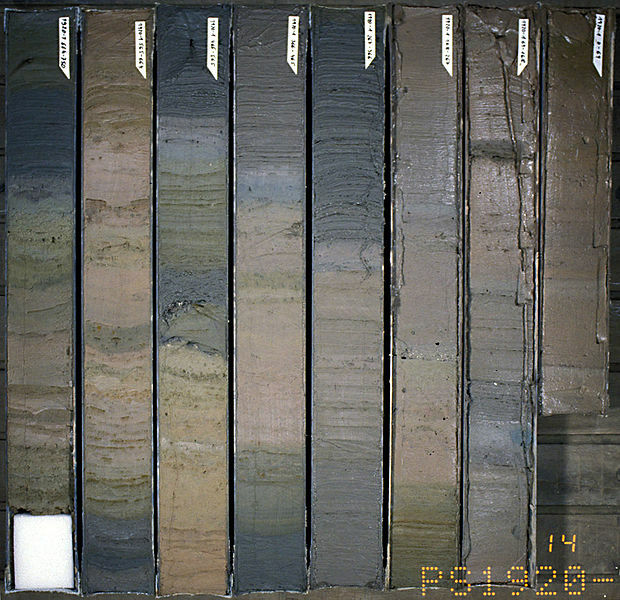 Radiocarbon dating of organic layers in the sediment cores and of tree remains in the glacier forefield provided the temporal constraint for identified glacier fluctuations. It was found that during the first half of the Holocene, from 10000-5000yrs before present, the local glacier was not extensive enough to provide input to On-Off lake. Tree trunks showing evidence of having been sheared by an advancing glacier were dated to approximatey 5000yrs old, representing the first evidence for local glacier advance during the Holocene. Between approximately 2750 years ago and the present day, the glacier front advanced and retreated over the On-Off lake drainage divide several times, as indicated by the switches between glacial and non-glacial sediments in the lake cores. Maurer et al. use historical photographs to supplement their geological record of Holocene glacier behaviour to the present day. This study corroborates other records of northern hemisphere glacier activity, which show reduced glacier extent similar to / less than that of the present day during the early Holocene, followed by glacier expansion in the latter half of the epoch, culminating in the Little Ice Age maxima 200-300years ago. Recent studies in the southern hemisphere appear to show the opposite behaviour, with glaciers at their maximum Holocene positions in the middle of the epoch (approximately 6000years ago) and have undergone overall retreat ever since. These studies (link and link) suggest that this asynchronous behaviour between hemispheres is connected and caused by the changing position of the intertropical convergence zone (ITCZ). This climatic boundary shifts northwards and southwards over various timescales, predominantly in accordance with changes in the Earth’s orbit of the sun. During the Holocene the ITCZ has slowly shifted southwards, increasing the proximity of southern hemisphere glaciers, such as those in New Zealand’s Southern Alps, to warm, tropical airflows. At the same time, this tropical influence is therefore reduced in the northern hemisphere mid-high latitudes. Glaciers are highly sensitive to changes in atmospheric temperature, therefore it is suggested that these changes in ITCZ position and the respective control on regional air temperature are responsible for the differences in Holocene glacier behaviour between the hemispheres. These findings are interesting as they suggest that the controls on glacier extent can switch between regionally-dominant (such as that shown above for the Holocene) or globally-dominant (such as during the last glacial maximum approximately 210000years ago, when glaciers around the world advanced synchronously). As this study (link) points out, since the industrial revolution c.1850 AD, the majority of the worlds glaciers have been retreating in synchrony, likely due to rising temperatures in response to increased global greenhouse gas levels. Is this the case? If so, was global greenhouse gas concentration controlling the synchronous glacier behaviour during the last glacial maximum? And, what causes the switches between regional/global dominant controls on glacier behaviour? 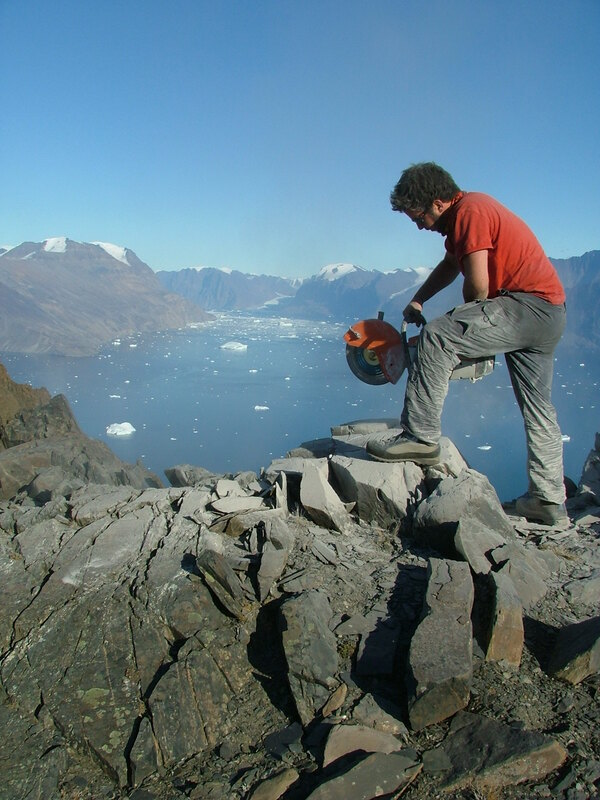 Further addition of well-dated, palaeoglacier and palaeoclimate records from around the globe will help to test hypotheses that aim to resolve these questions. We have an interesting seminar here at VUW this Thursday (21/6/12), where Professor James Kennett will be speaking about the ‘Younger Dryas Impact Hypothesis’ (YDIH). 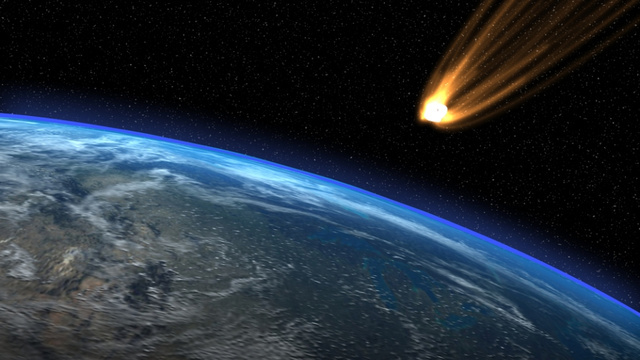 In short, the YDIH suggests that approximately 12900yrs ago, an extraterrestrial impact or ‘fireburst’ in the North American region caused widespread fires, the extinction of the Clovis culture and contributed to the rapid, short-lived regional cooling event observed in climate records covering that time frame. I was an undergraduate student on an exchange at a Norwegian university when this theory was announced at and I remember watching the press conference (see video below) with my lecturers. This is a controversial theory that challenges the longer held beliefs that the Younger Dryas resulted from the breakup of the last North American ice sheet. It is based on the discovery of a widespread carbon layer in sedimentary deposits that date to the start of the Younger Dryas at around 12900yrs ago. This is thought to represent the widespread burning that resulted from the extraterrestrial impact. The theory has sparked much debate and has also been widely criticized since it was announced at the AGU meeting in 2007. This went so far as a ‘requiem‘ being published for the YDIH. It will therefore be very interesting to here one of the original authors of the study talk to us firsthand about the evidence upon which this theory is based. I will post another blog about the seminar next week, and if I remember to bring my generic tablet device I may even do one of those ‘live-tweet’ things on my twitter feed. In the mean time here’s a bit of background to the Younger Dryas…. Following the peak of the last glaciation between 19000-26000years ago (commonly referred to as the ‘Last Glacial Maximum’ or ‘LGM’, the Earth’s climate was warming and the large ice sheets that had covered much of northern Eurasia and North America were retreating northwards. Similarly in the Southern Hemisphere, glaciers that had extended out from the mountain ranges such as the Southern Alps and the Andes were also retreating in response to the global increase in temperature. These climatic changes are thought to be caused by changes in the Earth’s position relative to the sun, which varies over known timescales. Following the LGM, a number of more rapid (c. 1000-2000 yr long) cooling-warming cycles occurred, until global climate stabilised at around 11000yrs ago. These rapid events were first identified in polar ice cores, where high-resolution records of past temperature changes are preserved in the layers of snow accumulation. The Younger Dryas represents one of these climatic events and covers a period of time approximately 1300 years long, between 12900 and 11600 years ago. It was first defined in fossil pollen assemblages in Scandinavia in the 1970s, where the relative abundance of pollen from plant species that inhabit cooler climatic zones increased, suggesting a decrease in local temperature. Subsequent work has shown that the Younger Dryas represents a period of dramatic cooling in the North Atlantic region, where a cooling of approximately 10degC caused glaciers to readvance in many parts of Europe and North America. One of these species is called Dryas octopetala, which is where the Younger Dryas gets its name (there is an Older Dryas, but that’s another story). The ice core records show that the Younger Dryas ended very abruptly, with rapid warming of several degrees occurring in a matter of decades. The fact that these changes occurred so rapidly and the fact that this occurred relatively recently (geologically speaking), has meant that the Younger Dryas is one of the most studied time-periods of the whole Quaternary. The main question surrounding this event is, ‘what caused it?’. The timescale over which it occurred is too short for it to have been caused by changes in the Earth’s orbit of the sun – as was the case at the LGM, therefore another explanation is needed. Early work (and work still being undertaken today) focused on trying to establish the geographic extent of this cooling event (i.e. was it restricted to the North Atlantic, or was it a global event? ), in order to try to identify the likely cause. In the mid-1990s, radiocarbon dates of a glacial deposit suggested glacier advance in New Zealand during the Younger Dryas. The author’s of this influential study (cited 192 times and counting), interpreted this as meaning that the Younger Dryas was a time of global cooling and suggested that this was driven by changes in the atmosphere, which are rapidly translated around the globe. However, refined dating techniques, such as surface exposure dating, and a greater range of climate records now suggest that the opposite is the case and that the mid- to high-latitudes of the Southern Hemisphere actually experienced warming during the Younger Dryas, whilst the North Atlantic experienced cooling. This is also seen in polar ice cores where Antarctica is seen to experience warming whilst Greenland cools during this period. The leading hypothesis for the observed differences in climate between the hemispheres during this time is known as the ‘bi-polar seesaw’ and was developed by eminent scientist Wally Broecker. Broecker recognised the role of the oceans in distributing thermal energy around the globe via density driven currents. In the early 1990s, following the development of the polar ice cores climate records (mentioned above), a correlation was made between these rapid cooling events and large inputs of freshwater (as recognised by marine deposits showing increased iceberg discharge) to the North Atlantic from the decaying North American and Eurasian ice sheets. It was suggested that these freshwater inputs altered the density of oceanic waters in the North Atlantic to an extent where the circulation slowed, therefore reducing the heat flux from the South to the North and causing cooling the North Atlantic region and warming in the Southern Ocean. This reconciles well with the interhemispheric asynchrony observed in glacier advance records (outlined above). No iceberg deposits are found to be associated with the onset of the Younger Dryas and initially Broecker hypothesised that the freshwater input associated with this event was sourced from Lake Agassiz, a large body of terrestrial water that was dammed by the former North American (Laurentide) ice sheet. However, later work could not reconcile the timing of the main drainage of this lake with the onset of of the Younger Dryas. Other studies have identified a different route for the lake drainage, that appears to coincide with the onset of cooling. This publication represents the most recent research output of an ongoing international collaboration between researchers from New Zealand, USA and Norway, which has been using the records of past glacier fluctuations in the Southern Alps to understand climate change from the Last Glacial Maximum to present (c.30ka-present). The first step of this project was to produce detailed maps of the local glacial geomorphology in order to document the past size and extent of glaciers in the Southern Alps (e.g. Barrell et al. 2011). The second step was to date these landforms in order to correlate deposits between glacier catchments and also to be able to compare results to other well-dated climate records of similar age (e.g. Schaefer et al., 2006; 2009; Kaplan et al., 2010; Putnam et al., 2010). This paper by Golledge et al. 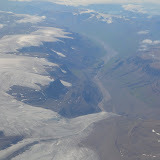 represents the third phase of this project, which utilises computer models to numerically simulate the past glaciers, from which, quantified estimates of past climate can be derived. To do this, Golledge et al. use a complex numerical glacier model (called ‘The Parallel Ice Sheet Model’ or ‘PISM’, for short), which has been jointly developed by researchers at the University of Alaska, Fairbanks and Potsdam Institute for Climate Impact Research. This model uses physical equations that mathematically describe the different components of ice flow. Golledge et al. perform a series of experiments, whereby they manipulate the different glaciological parameters of the model (e.g. ice deformation and flow, internal and basal stresses) against the geomorphological evidence, in order to determine the most appropriate values. Once this is completed, the climatic variables (temperature and precipitation) are manipulated and compared to the geomorphological evidence, in order to provide an envelope of the likely climate change that caused glacier advance to the mapped and dated limits. Figure 1: Modelled ice extent using temperature depression of 6degC (top) and 9degC (bottom) from the present day (Source: Golledge et al., 2012). Figure 1 shows that the initial, low-resolution (2km grid square) model runs showed that a temperature decline of 6-7 degrees produced the best match between modelled ice extent (grey) and ice extent identified through geomorphological mapping (black line). The mis-matches at the margins of the various outlet glaciers are likely to be due to the coarse resolution of the model, where the outlet valleys are narrower than the resolution of the model run (2km). Narrowing down the likely temperature change at the time of this glaciation (e.g. 6-7degrees lower than at present), allowed Golledge et al. to maximise their computational efficiency in simulating the past icefield at much higher spatial resolution (500m). At this scale, they find that the optimum climatic conditions (i.e. those where the modelled ice best fits the geomorphological evidence) are a 6 – 6.5degC cooling, accompanied by a precipitation change of 0-25%, relative to the present day. Comparison of these values to those derived from other palaeoclimatic proxies allows Golledge et al. to make inferences about the past climatic regime of the region. The temperature change compares favourably with those from other proxies. For example, temperature estimates from bacteria accumulations in LGM lake deposits suggested LGM cooling of 5.6degC in the Southern Alps (Zink et al., 2010). Meanwhile, regional numerical climate models suggest a cooling of 7.5degC (Drost et al., 2007). In comparing their results to past sea surface temperatures Golledge et al. find that their results are more aligned with those from sub-Antarctic influenced water masses (6.8degC) than sub-tropical (4deg C). They suggest that the local climate at this time was therefore still significantly influenced by southerly winds. Regarding past precipitation, Golledge et al.’s finding of potentially drier conditions at the LGM in New Zealand are consistent with other studies (e.g. Whittaker et al., 2011) that have suggested this was caused by a reduction in strength of the prevailing westerly winds across New Zealand, during the LGM. In some ways this paper represents the culmination of many years work, from the initial mapping stages, through the development of high-resolution chronologies and now to a palaeoclimatic context. The significance of the terrific geomorphological records of past glaciations in New Zealand’s Southern Alps has long been recognised – as evident in the numerous and influential studies (e.g. Porter, 1975). Understanding regional climatic response to global events such as the Last Glacial Maximum allows us to better understand processes driving past climatic change and New Zealand represent one of the few landmasses in the Southern Hemisphere where such records exist. Future work will focus on improving the chronological constraint of glacier fluctuations in the region and using high-resolution, catchment-scale glacier models to better understand the responses of different glacier types to climatic forcing. 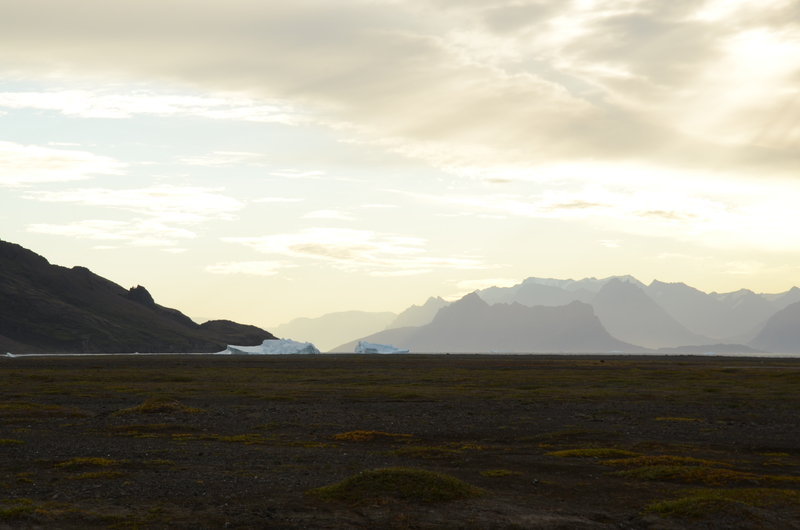 The main objective of my PhD is to reconstruct the retreat of the Uummannaq Ice Stream System, a large system of coalescent ice streams in West Greenland. To constrain the timing of the retreat of this ice, we are using a technique known as cosmogenic nuclide dating. Cosmic rays, originating from outer space, bring rare cosmogenic nuclide isotopes (I am using 10Beryllium and 26Aluminium) to the Earth’s surface, where they build up in exposed rock surfaces at known rates. The total concentration of these isotopes in a rock surface therefore represents the length of time that the surface has been exposed to the atmosphere. This provides an ideal method for determining when a glacier retreated from a region, hence exposing the ground beneath. 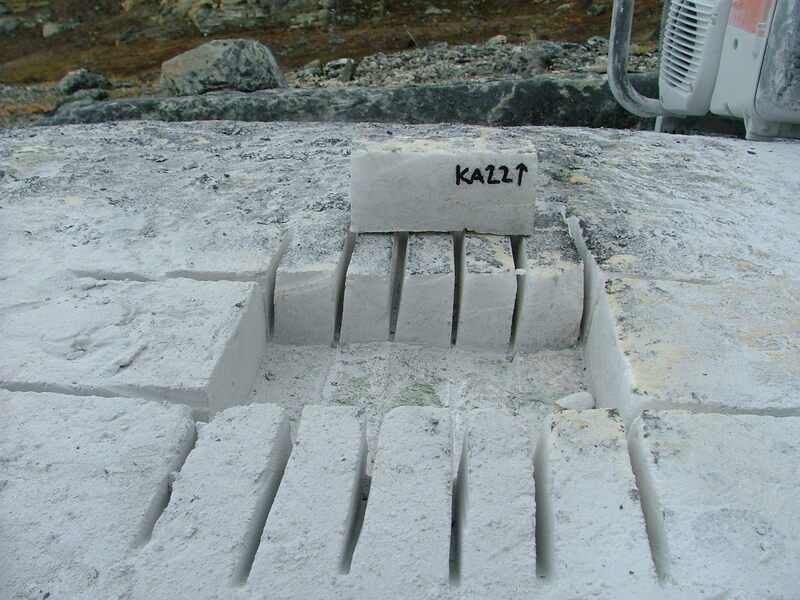 Technological developments in the last few decades have allowed more precise measurements of their concentration in terrestrial rock samples and this dating technique is becoming increasingly popular. Having collected the samples in the field and received funding to run them, I went up to the Scottish Universities Environmental Reserach Centre (SUERC) laboratories in East Kilbride to start the process! 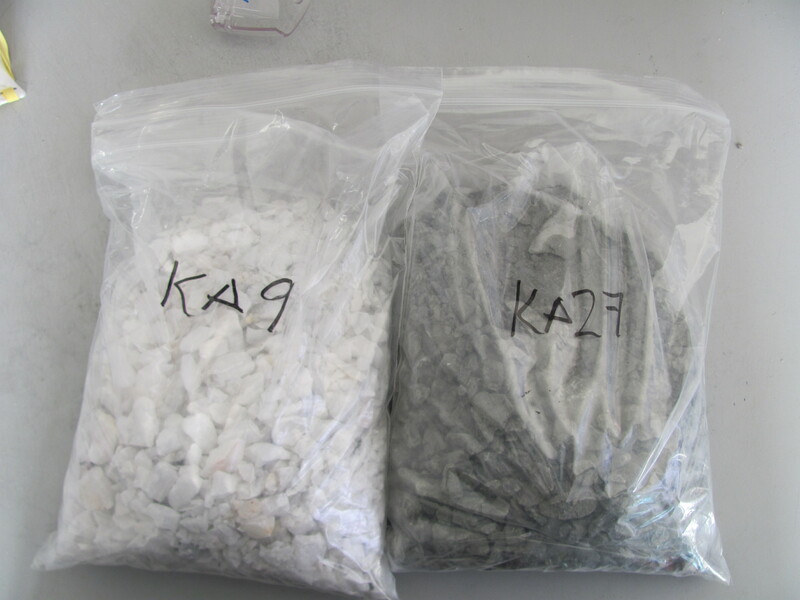 As 10-Beryllium and 26-Aluminium preferentially build up in quartz, the aim of the first week was to crush down the samples and extract as pure quartz as we could. Firstly I had to crush the samples in the workshop to shards, and then grind them down on a disc miller. This was very noisy and dusty, and fairly hard work, but good fun. 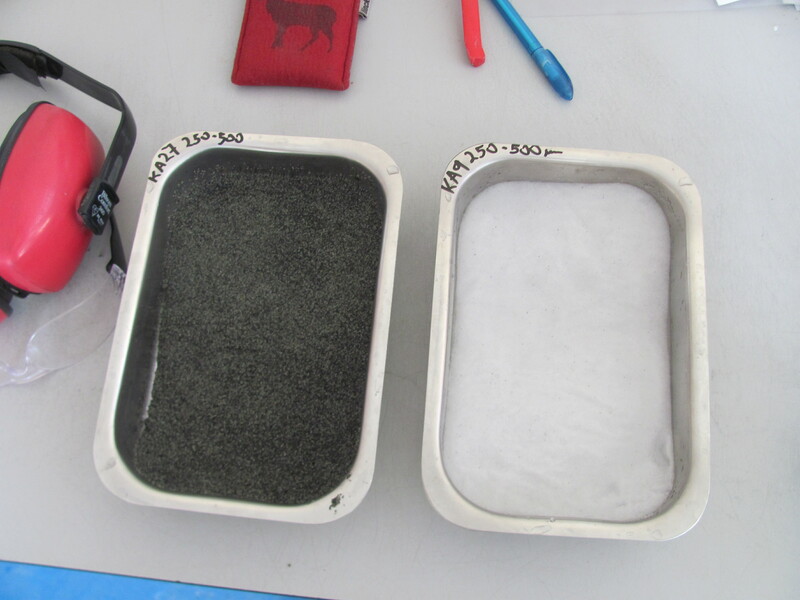 The ground up rock was then sieved, and we retained the 250-500µm size fraction, keeping the rest in case we didn’t have enough quartz in these. Crushed rock having been crushed and sieved. Note how different in mineral content the rock samples can be! The final step for this week in the labs was using the Frantz machine. A hopper slowly releases the grains of crushed rock onto a track which vibrates past a very strong electro-magnet. Any magnetically charged particles are attracted to this and taken down a separate track, into a separate container. The non-magnetic particles (such as quartz), aren’t attracted, and take a separate route (see video below). So, I’ve now left my samples there with the lab staff for a series of etches with hydrofluoric and nitric acid. I’m heading back in about a month to finish the samples off and then run them on the mass spectrometer. Hopefully then it will spit out some nice dates which I can use to develop a deglacial chronology for the northern half of the Uummannaq Ice Stream System! Glaciers transport material down-valley in a variety of different ways. It can be carried in meltwater (glaciofluvial), entrained and dragged along the base of a glacier (subglacial), buried within the ice (englacial), or carried on the glacier surface (supraglacial). Of course these processes vary both spatially and temporally, a single rock or grain of sand may experience all of these transport mechanisms during its journey from the top of a mountain to a glacier foreland. For example, a rock may fall onto the surface of the ice and be carried supraglacially, before being buried and becoming englacial, brought to the base of a glacier and transported subglacially, and finally melting out and transported down valley glaciofluvially. Supraglacial material is derived from mass movement events on free face valley walls or nunataks adjacent to the glacier. The video at the top of this post shows one such event on the Franz Josef glacier, South Island, New Zealand. 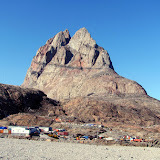 This was captured on video by a lucky (no one was hurt) tour party that visited the glacier that day. Debris covered glaciers have a lower albedo than clean-ice glaciers. This insulating debris layer means ablation is lower; therefore debris-covered glaciers are less sensitive to climatic change. It has been hypothesised a rockfall event at the Franz Josef glacier ~13,000 years ago caused a non-climatic glacial advance, responsible for depositing a large terminal moraine, named the Waiho Loop, 14km downvalley of the current glacier terminus. 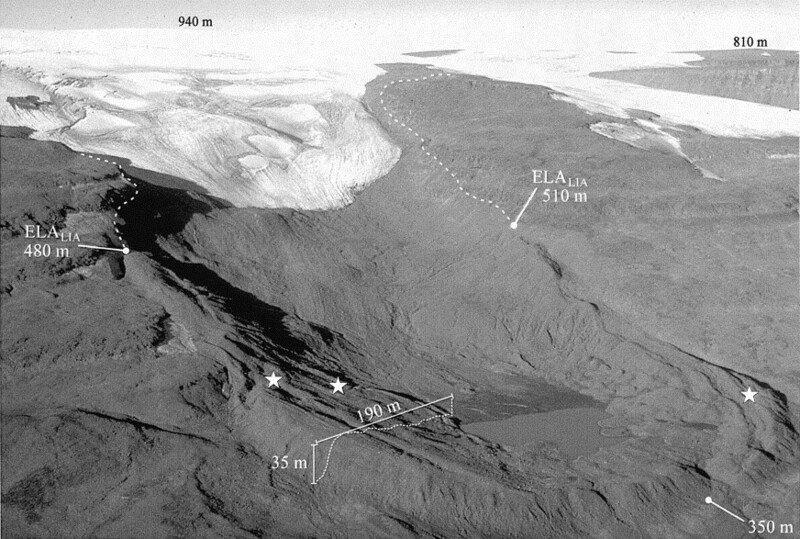 This theory originated when it was found that a lot of the Waiho Loop moraine was made of supraglacial debris. Supraglacial debris is typically very angular (see the rock the tour guide is holding at 1 min 40 seconds), as it has undergone very little active transport, compared to debris that is rounded at the base of a glacier . In the mean time, enjoy the video. This video was found on The Landslides Blog. A story from the local paper can also be found here. ‘Piled Higher and Deeper’ brings to life the popular ‘PhD Comics’ series published by Jorge Cham, which satirises the journey of graduate students as they try to forge a career in academia. The film itself follows the journey of two main characters from the comics: the young, fresh-faced, naive ‘Nameless hero’ (whose name is revealed at the end of the movie) striving to impress the infamous Professor Brian Smith; and Cecilia the grad student juggling TA responsibilities with her doctoral work. The 67min film is divided into chapters that follow the typical structure of a academic thesis. In the ‘Introduction’ we see the nameless hero attending interviews at various prestigious universities as he battles other A-grade students and the busy schedules of potential supervisors to try to win a place in grad school. The rest of the film follows his progress as he is taken on by Professor Brian Smith as one of his ‘lab rats’, forced to work long hours with ancient equipment for little to no recognition. Mike Slackernerny is appointed as the hero’s mentor and throughout the film introduces him to some of the golden rules of graduate research, namely: stock up on free food at every opportunity; be prepared for all technical equipment to cease working when your supervisor comes within a 5m radius; and, never, NEVER, ask anyone how their research is going. The scene is also set for Cecilia who is coming towards the end of her doctoral work and is finding herself ‘waiting for someone to die’ so that a faculty position becomes available. She struggles to balance her teaching responsibilities, which include listening to undergraduate excuses for extension requests, and ensuring their grades fit a Gaussian distribution with a mean of 61.871 to her supervisors satisfaction. Hats off to whoever was in charge of casting as the likeness of some of the actors to their graphic counterparts is uncanny! In particular Professor Brian Smith who comes complete with obligatory beard and really brings to life that insensitive glare from the other side of the desk. Mike Slackernerny’s hairdo is similarly well cast. One continuity issue that I noticed was the nameless hero’s haircut – it seemed to differ in every scene. I’m not sure if this was purposeful in order to represent the passing of significant amounts of time or is just representative of the order in which the scenes were filmed, but it certainly stood out. One question that I left the screening with, is how much actual PhD students identify and agree with the stereotypes portrayed in both comic and movie. Speaking to people after the screening, all of them admitted while they could relate to small things like being poorly paid and pulling the occasional all-nighter, the majority actually have very good relationships with their supervisors and thoroughly enjoy their research. This is something that stood out to me long before this film came out. When I learned that I had got scholarship for my PhD I immediately began reading postgraduate blogs and advice online and was struck by the severe lack of anyone saying how much they enjoyed their time spent doing doctoral research. I know people who have bad experiences are more likely to vocalise them, but for any undergraduates keen to continue in academia, a quick Google search of ‘life as a PhD student’ will soon have them filling out industry job applications. Perhaps Jorge Cham could produce the odd comic strip that portrays the joy of winning a research grant for example, or at least postgrad bloggers could be a bit more vocal about such things, no? Overall, the film is very enjoyable with many laugh out loud moments – usually those taken straight from the original comic strips and is probably best enjoyed in the company of other grad students, while enjoying some free pizza (thanks Postgraduate Student Assoc!). Using the Powers Roundness rating scheme I’ll award this film a rating of Sub-Rounded.